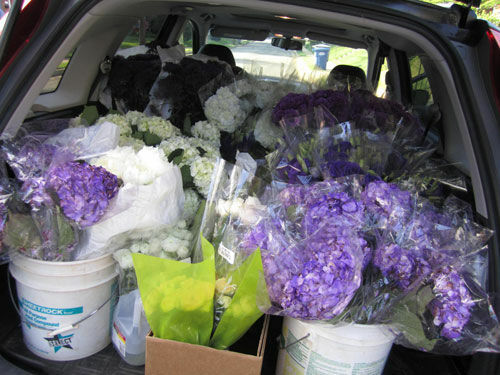 This is what every bride’s car looks like the morning before their big day right? No? 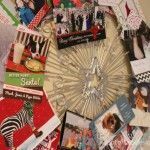 Well this is what Allie’s looked like for her May celebration! 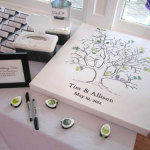 With experience in floral arrangements for her step siblings’ weddings, Allie was confident she could buy and create all the flowers (table and accent centerpieces, aisle runners and bouquets) for her big day! With the help of us bridesmaids, that’s just what we did! After bringing in all the flowers, cranking up the AC and rearranging furniture in her suite at the hotel, we got to work. 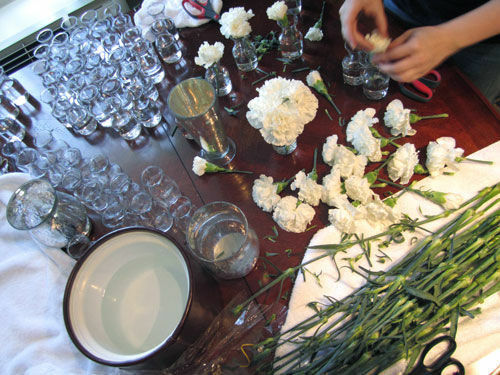 Above is the assembly line process to create the mini bud vases of white carnations. Clean, cut, strip of leaves, arrange! Making the bridesmaid bouquets took a little more work. 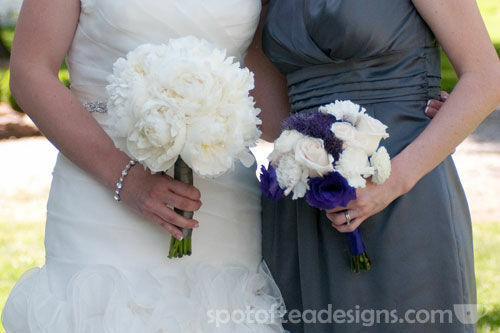 Allie included a mixture of white roses, purple lisianthus, white carnations, and purple trichileum. First, start arranging the long, clean stemmed blooms in your hand and try to keep it tight. 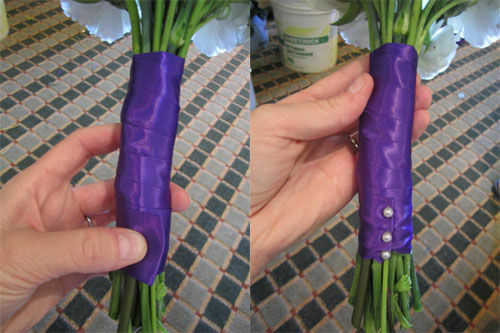 Next, wrap floral tape tightly around the stems. 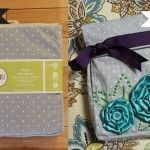 Tip: When working with floral tape, wrap once around the stems, then pull to stretch the tape as you twist it around. Stretching it releases the sticky material needed to help hold it together. Yes, your hands will get sticky! Trim the stems to the desired length. 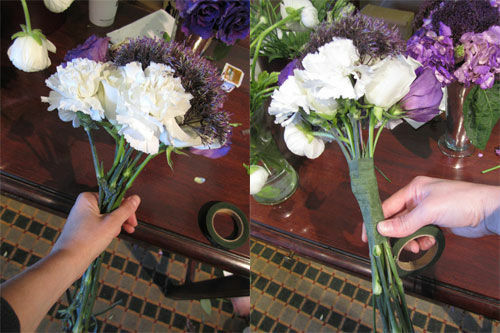 To wrap the bouquet with ribbon, first wind around the center of the stems then rotate up towards the top then back down smoothly. At the end, trim the ribbon and tuck the end over itself. Use decorative corsage pins to hold the ribbon in place. We used anywhere from 3-5 pins per bouquet with white, pearl tips. Here’s a finished picture of my bouquet and Allie’s beautiful peony filled bouquet! 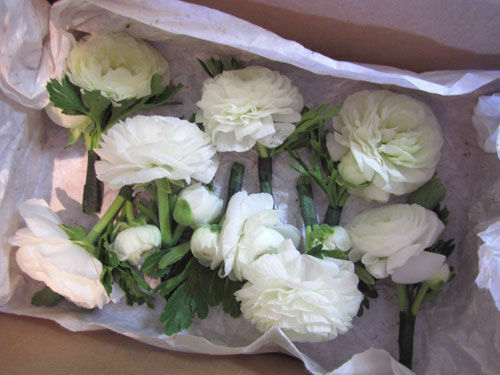 The groomsmen boutonnieres were made with white ranunculus blooms. Some had 2 blooms, showing one large and one small bud for a cute accent! To transport the flowers, we turned the long-stemmed flower boxes upside down and cut “X”s in the top so the holes would hold the vases tightly. 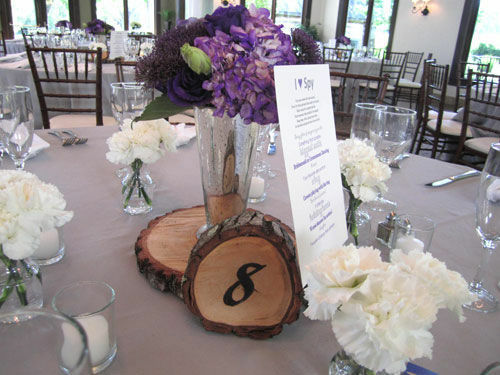 Tall, mercury glass vases were filled with purple hydrangea, purple trichileum and purple lisianthus to become the centerpiece at the reception tables. 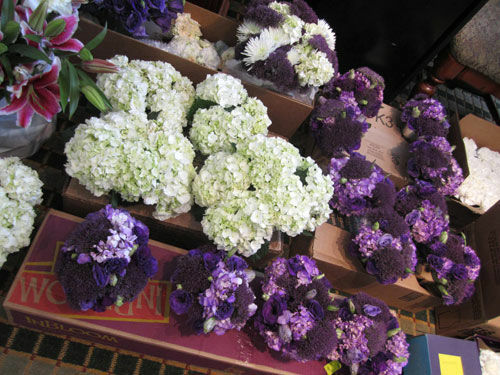 These were surrounded by several of the white carnation bud vases and white candles to complete the white/grey/purple color palette. 3-4 large white hydrangea bloom clusters filled tins (purchased at Ikea) and hung on shepherd’s hooks down the aisle of the outdoor ceremony. 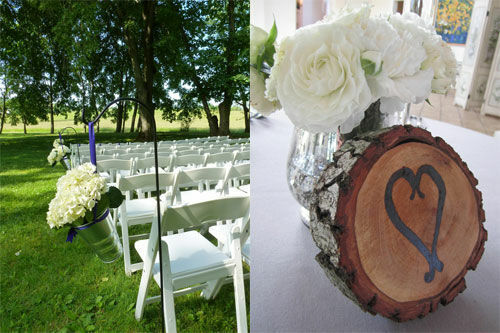 After this wedding, I think I can now put “Floral arrangement” experience down on my resume! Absolutely gorgeous! Stunning and beautiful.